I love this quilt. I so enjoyed making this quilt and watching it come together. I love high contrast fabrics so much and putting them together with white solid fabric is so eye catching. After I finished the Zuzu quilt, I really wanted to do something similar, only with squares. I knew I wanted patchwork, but I didn’t want the whole quilt to be patterned fabrics, so I broke it up with blocks of white and I think the design is bold because of it. I have lots of gorgeous blue fabrics from a block of the month club I joined and decided I did not like. I didn’t like the blocks, but I loved the fabrics – gorgeous Cotton & Steel, Robert Kaufman, Art Gallery, Carolyn Friedlander, etc. These were so fun to sort through and select for the quilt. For the construction of this quilt, I made nine-patch blocks by cutting 3″ strips of fabrics from the width of fabric and then cutting those down to 3″ x 10″ strips. I sewed three strips together, randomly, and then subcut these into 3 strip sets. Then after I had sewed multiple strip sets, I sewed these randomly together to get nine-patch blocks. I pressed all the seams one way on all my strip sets, so I could nest the seams together when I did the nine-patch blocks. 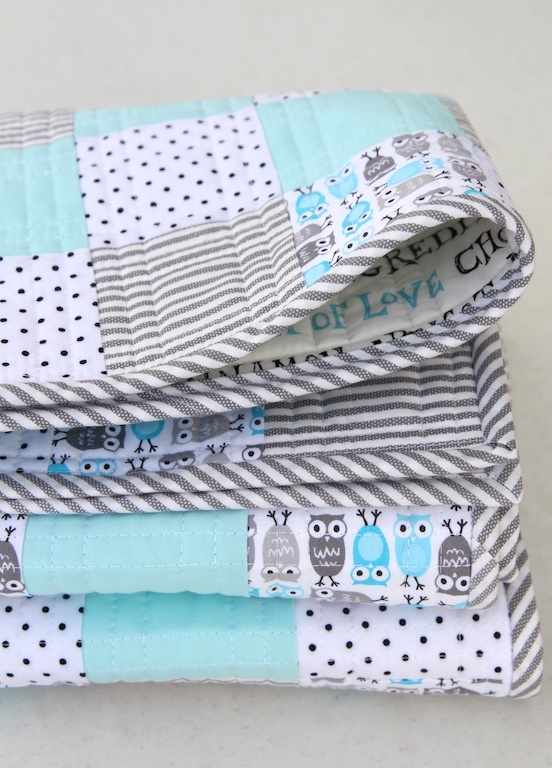 Make sure all the seams are pressed the same way on your finished blocks so that you can alternate seams on your rows and nest them together. After your blocks are sewn, trim them to 8″ square. After I had all my nine-patch blocks finished, I cut 8″ squares of solid white. Then I laid out the quilt randomly, alternating nine-patch blocks and white blocks. I made 46 nine-patch blocks and cut 17 squares of solid white. I was going to do a scrappy binding, but then decided to use a tiny navy blue and white dress stripe from Dear Stella that I thought went nicely with the quilt. I did my usual machine binding for extra durability. I stitched in the ditch for the quilting, because I felt I didn’t want the quilting to interfere with the beautiful patterns in all the fabrics. I also used TWO layers of Warm and Natural Warm and White cotton batting again. This makes the quilt extra heavy and extra warm and it has become my favorite way to make a quilt now. I just love the extra heft and weight that it gives a quilt. I actually gently prewash my batting because I don’t want it to shrink much when it’s in the quilt and laundered in the future. Warm and Natural batting actually holds up well in a gently prewash, but other battings I’ve used do not. I think that shows how well the batting will hold up once it’s in the quilt and going to be washed for years to come. The backing fabric is an absolute favorite of mine – 108″ wide quiltback “Language of Colors” by Windham Fabrics. I just love this fabric and the punch it adds to a quilt, without competing with the front of the quilt. The finished quilt is 52″ x 67″, a great size to snuggle up with. This quilt is for sale and I’m listing this in the Shop. This entry was posted in finished quilts on March 7, 2017 by Beech Tree Lane Handmade. This quilt all started with the backing fabric. 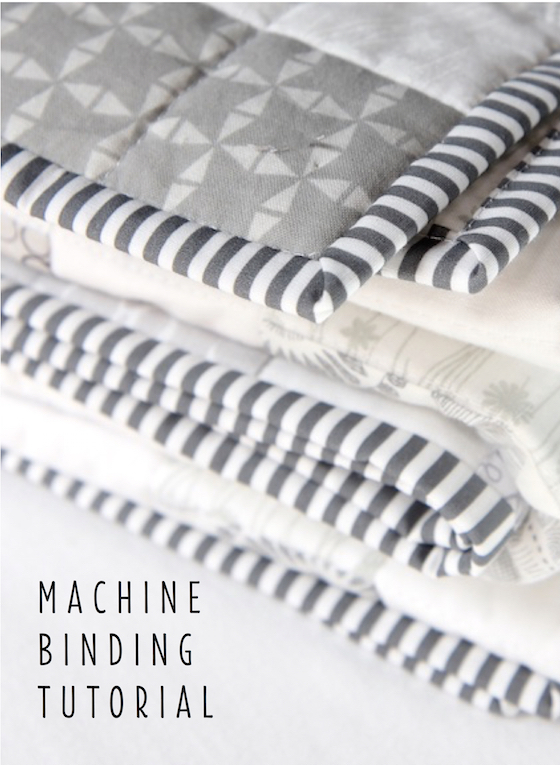 I saw this fabric and fell in love with it and knew right away I wanted to do a red, grey and white quilt top – a top with stark white fabric. The quilt backing fabric is Zuzu Circles by Alice Kennedy for Timeless Treasures. Isn’t it just so awesome? I had a lot of fun picking out reds and grey fabrics from my stash. I tried to only use fabrics that had a lot of high contrast to them. I used Kona White as the background fabric and wanted the prints to really stand out against that. I also cut up some of the backing fabric and used a little of that on the front, too. The blocks were made up of eight 3″ x 2.5″ rectangles sewn together and then two 2″ x 8.5″ strips of white sewn onto the sides, to make an 8.5″ block. I used some 8.5″ plain squares of Kona white to make some negative space on the quilt. There were 54 blocks total for the whole quilt, 6 across and 9 blocks down. I used Warm and White cotton batting for this quilt – a must for white quilts where you don’t want the batting to dull the whiteness. I used TWO layers of batting on this quilt – I wish you could feel how heavy and warm that makes the quilt. I’ve been doing that a lot lately and really like it. 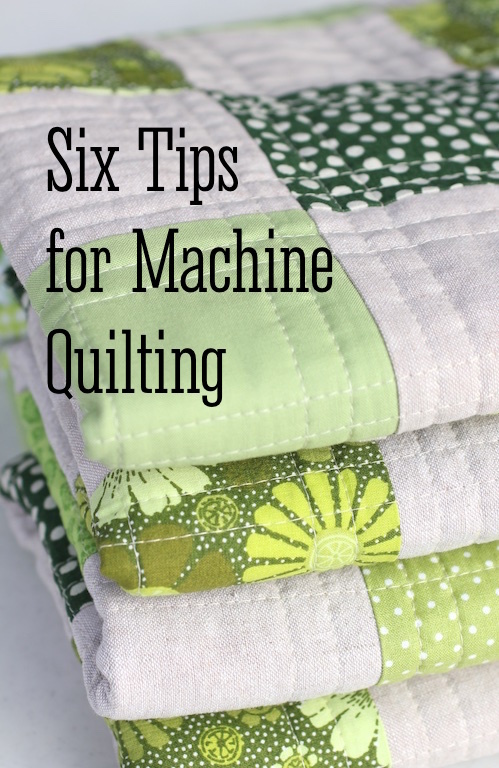 It still machine quilts up just fine. If you use two layers of batting, do make sure that you use a heavier needle – a #14 quilting needle, to get through all those layers. For the binding, I had to go with my favorite gingham binding and it was perfect because I had used some of the gingham in the quilt top. It’s Robert Kaufman Carolina ⅛” Gingham in Silver. This quilt finished at 48″ x 72″, a great size to curl up for a nap with – it’s long enough for just about anyone. I never make my quilts more than 60″ wide, though, because that is the width of my ping pong table and that is where I baste them! 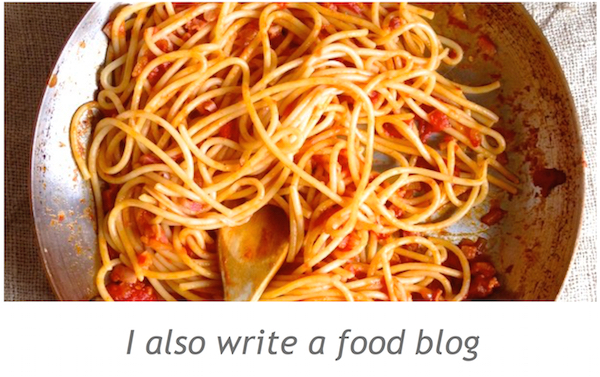 I can make them as long as I want, though. This quilt top sewed up so quickly – it was done before I knew it. My least favorite part of quilting is sewing the quilt back together. I’ve been using a method recently that makes this process a lot easier ➡︎ I’m going to be posting about it next time, I hope! This entry was posted in finished quilts on February 20, 2017 by Beech Tree Lane Handmade. I always had a vision for this quilt – using only dotted fabrics of all sizes and only in black and white. I used great big dots and pin dots and everything in between. It made a very modern, bold quilt. Normally, I don’t like to make flying geese blocks because there’s so much wasted fabric but in a future post, I’m going to show you how to make them using a no-waste method. I thought about putting these flying geese on a white background but it seemed a little too stark. I then pulled out one of my all time favorite fabrics from Zen Chic – Ink Modern Background in Grey. I paired this with Robert Kaufman Kona Solid in Silver and randomly made all the backgrounds in the blocks from these two fabrics. The flying geese themselves were made of many different dotted fabrics from my stash. I wasn’t able to identify every single dotted fabric but here are some that I know and are a favorite, in case you are wondering what some of them are: Jumbo Dots by Loralie Harris – if you don’t know her line of dotted fabrics, check them out! So very fun and inspirational. Another dotted fabric I really love is Hello Bear Firefly in Whisper, an Art Gallery Fabric. The finished quilt is 55″ x 61′. Each flying geese block was 3″ x 6″. I made 180 blocks. I made them using Bloc Loc rulers, which I’m going to write about in a future post. This method made these blocks very easy to make and very accurate. For the backing fabric, I wanted to keep the dot theme going so I chose a fabric from Robert Kaufman’s Spot On collection in Steel. It’s a 108″ wide fabric, perfect for a quilt backing. It was the perfect color and complement to the front, I thought. For the batting, I did something very different. For this quilt, I pictured a heavy, warmer quilt than just the regular layer of cotton batting. But I didn’t want a tied quilt. So I took a chance and used two layers of batting and machine quilted it. It worked great! And I ended up with a nice, heavy, more substantial quilt. Very warm. I used two layers of The Warm Company’s “Warm Bond” quilt batting. It’s an 80/20 batting, which they are actually discontinuing. But I heard from The Warm Company and they say they are working on a new 80/20 batting, which should be available this November. I ditch stitched the whole quilt because I just couldn’t picture a good quilting pattern that would look right on the flying geese. I used a light gray Aurifil 50 wt thread on the top and a darker gray in the bottom, to match the backing fabric. For the binding, I just had to give the quilt a little pop of color with all that grey, white and black. And the binding had to be a solid – no stripes or patterns. There is just way too much going on with the quilt itself. But which color? After trying several possibilities, I ended up with the Kona Cotton Solid in Caramel. I just love how it looks on the quilt. I’ll be putting this quilt in the Shop. I’m linking up to Free Motion by the River, Sew Cute Tuesday and Let’s Bee Social over at Sew Fresh Quilts! Check it out! This entry was posted in finished quilts on September 30, 2016 by Beech Tree Lane Handmade. I had such fun using these 1930’s vintage reproduction fabrics for this quilt. They remind me of when I was young and my great grandmother died and I was given a large tin of her fabrics that she had cut out for quilting. These fabrics remind me so much of those. I designed this quilt using Half Square Triangles, placed so that they looked like diamonds. Each HST had a vintage style fabric on one side and a low volume fabric on the other. I’ve already received quite a few inquiries about the low volume prints, so I’m going to try to list as many as I can in this post with lots of links. The finished block size (after sewing into the quilt) was 4″. I cut 5.5″ strips and then cut these into 5.5″ squares. From these, I made my HSTs and then trimmed them down to a working size of 4.5″. There were 180 total HSTs. Most of the low volume prints I used in this quilt were from the AWESOME Robert Kaufman collection called “Hints in Prints”. I purchased these fabrics from Pink Castle Fabrics in Ann Arbor. Finding this kind of tiny low volume print isn’t easy and this collection is so great. Pink Castle has fat quarters of this collection and yardage. These tiny prints were the perfect complement to the vintage style fabrics. The 1930’s style fabrics were some of my old favorites from Marcus Fabrics’ Aunt Grace line: this cute blue, this awesome pink , this classic blue and this sweet old fashioned yellow. I also used some cute fabrics from Penny Rose’s Milk, Sugar, Flower line that I love so much. Then I used this sweet pink fabric from Windham’s Storybook Vacation line. 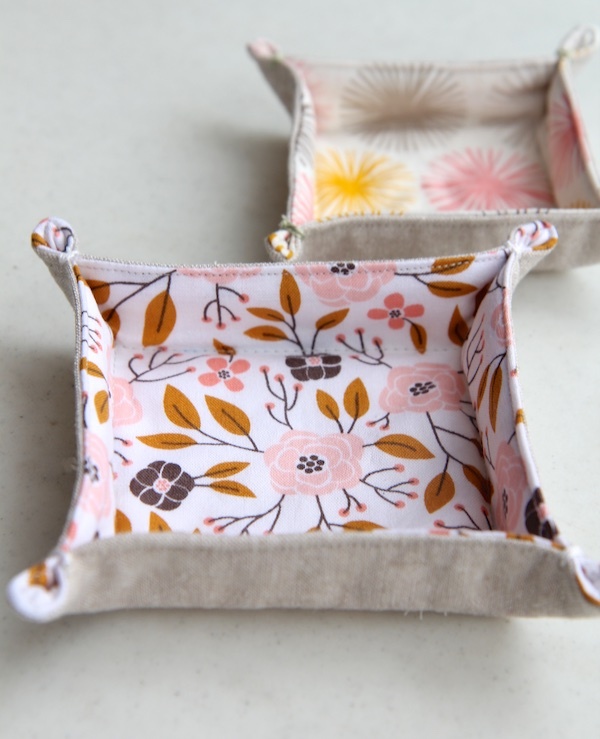 The backing is a special fabric from Japanese designer Atsuko Matsuyama for Yuwa. It’s called “Language of Flowers” and it’s from the 1930’s collection – how appropriate. It features lots of flower information and old fashioned classic recipes. It looked like it fit this quilt just right. I purchased this fabric also from Pink Castle Fabrics . The batting I used was Warm and Natural 100% cotton batting, my usual batting choice. When I decided on how to quilt this project, I wanted to emphasize the diamonds, so I quilted on the diagonal, outlining the diamond shapes and then I did a vertical quilting down the rows and also stitched in the ditch. I used Aurifil Natural White #2021, 50 wt. thread for the top and Light Sand #2000 in the bottom, to match the backing fabric. The Natural White thread is a really nice soft white, not as stark white as the regular Aurifil White. I just thought it was perfect for the top. I quilted at a 3.5 stitch length. The binding is one of the fabrics I used in this quilt – Toy Chest Floral Field in Red – and when I was trying to decide on a binding, this fabric seemed like it gave the perfect pop to the quilt. I love it. This fabric is just one of the line of sweet vintage fabrics designed by Sara Morgan called Toy Chest. When I attached the binding, I used Aurifil #2260 Red Wine in the bobbin, to match the binding fabric on the back of the quilt. I had the Natural White in the top thread. I used my usual method of sewing the binding on the front, wrapping it to the back and then stitching in the ditch on the front to attach the binding to the back of the quilt. 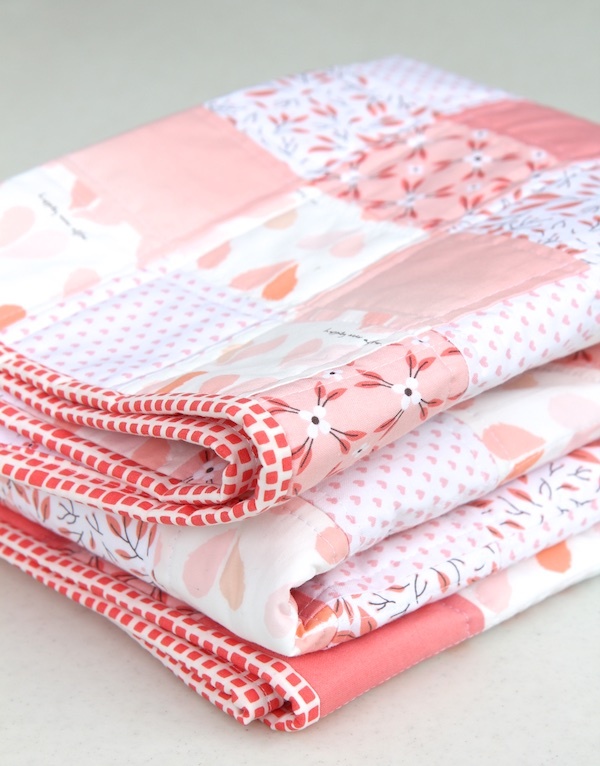 I’m linking up to Crazy Mom Quilts, Sew Fresh Quilts, Free Motion by the River and Blossom Heart Quilts. This entry was posted in finished quilts on April 25, 2016 by Beech Tree Lane Handmade. I’ve had such a great time making this quilt, from the fabric selection to the extensive grid quilting. This quilt came about by me experimenting with cutting up strip sets of solid colors. I played around with a few colors and in the end, decided that just two colors of high contrast had the most impact. I sewed together 3.5″ strips, and then cut these into 6.5″ blocks. I used 12 strips of each color to make all the blocks, for a total of 90 blocks. The colors I used were Robert Kaufman Kona Cotton Solids in Black and Tarragon. I took all the blocks and arranged them so that they looked like they were in some pattern, but they actually weren’t. This was enormously fun. Really. I had such a great time rearranging the blocks into all kinds of designs. My youngest son, home on college break, walked by and said, “That looks like a maze”. Hence the name. For the backing, I used a great fabric I’ve had in my stash for a while, patiently awaiting the right quilt. And this was it. The fabric is Color Names in White, purchased from Pink Castle Fabrics. It complements the modern, graphic look of this quilt. This is an excellent backing fabric, because it is a 108″ wide fabric, with no need to piece the back. Yay. Piecing backs is the only part of quilting that I don’t enjoy. I used Warm and Natural 100% cotton batting, a favorite. I prewash and dry the batting so that there will be little to no shrinkage after the quilt is washed at some point. I quilted this in an all over 1″ quilting grid, which took lots of time and focus, but was lots of fun. It was addictive to see the texture developing, as more and more lines got quilted. The quilt has a wonderful feel and drape to it, because of the quilting. The thread I used on top for the quilting was Aurifil #2902 in Laurel Green. It’s a 100% cotton thread from Italy and is wonderful. It hardly produces any lint at all, even with extensive quilting. I used the 50wt. I put a light color in the bobbin, however, to match the backing fabric. To sew the grid, I just used my seam guide and attached it to my walking foot. For the binding, I tried out a few different fabrics and ended up using Sandhill Charcoal from M&S Textiles Australia. I had to laugh because, coincidentally it was the same fabric in a different colorway that I used for the backing for my English China Quilt, a recent finish. It’s a really neat fabric and I loved the effect as a binding. When I sewed the binding on, I used the Laurel Green Aurifil thread in the top and black thread in the bobbin, to match the binding. 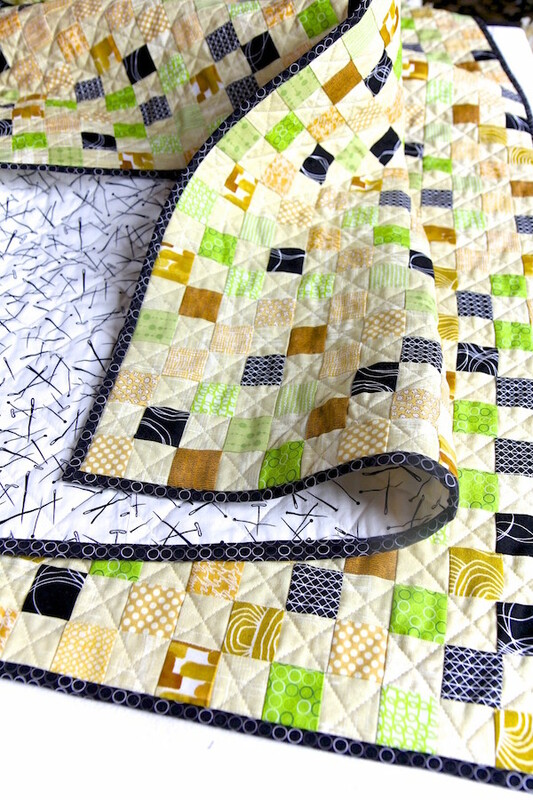 This quilt finishes at 54″ x 60″, a really nice size for a throw quilt. 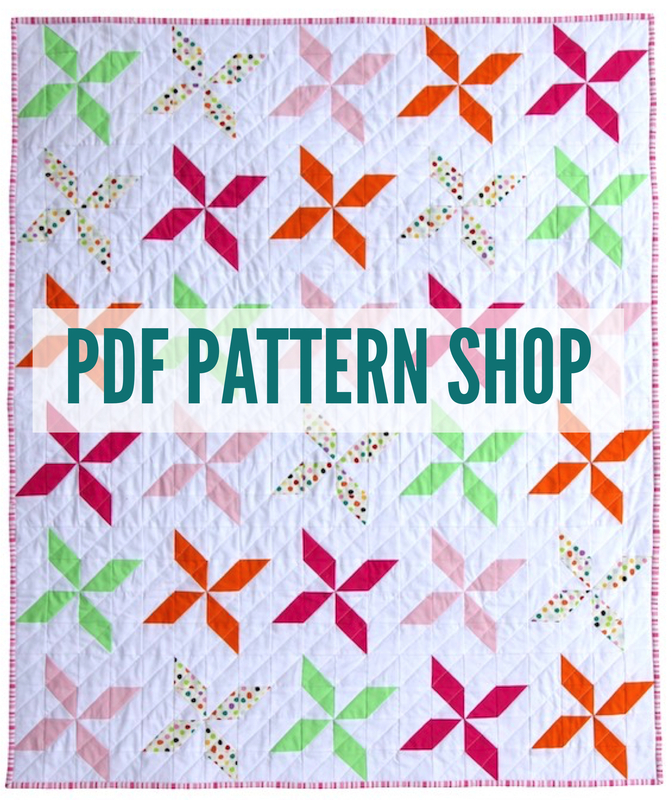 I love the bold modern graphic feel of this quilt. I think it would make a great design element in a room. I’m listing this quilt in the Shop. Thanks for coming by – hope you’re making something! This entry was posted in finished quilts on April 4, 2016 by Beech Tree Lane Handmade. What fun this quilt was to make and what an impact solid fabrics can make in a design. 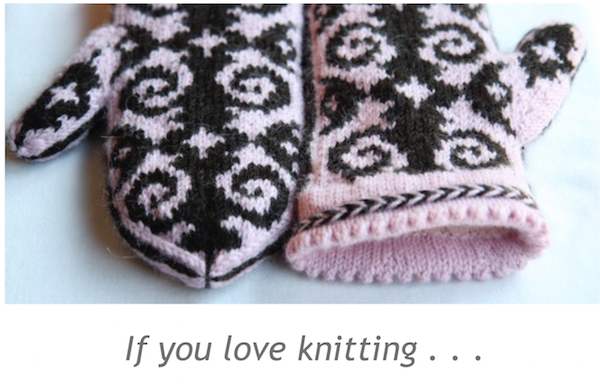 I am continually adding to my stash of Robert Kaufman Kona Cotton Solids and love using them. I do love all things gingham so it was time to make a gingham quilt. I absolutely love the high contrast of the navy and the white in this super soft quilt. The solid fabrics I used were Robert Kaufman Kona Cotton Solids in Navy, Candy Blue and White. This quilt finishes at 44″ x 52″, a nice size for a child’s quilt. Each finished block is 4″. The cutting and piecing was straightforward: I cut WOF strips of 4.5″ and then subcut them into 4.5 squares. I cut 42 white squares, 71 light blue and 30 navy squares. The backing fabric was a super cute alphabet/number print by Quilting Treasures called ABC/123 in Blue. I love fabrics like this that can be used for playtime with a child to learn their numbers and letters – things that take me back to raising my boys. For the binding fabric, I knew right away this coodinating stripe fabric from Quilting Treasures was what I was going to use. It has that zing factor for a binding and really pops against the solid fabrics. I had to restrain myself from cutting this stripe on the bias, because I really love bias bindings – but I thought this stripe had enough punch to just cut it crossgrain. And it does. I made 2.5″ strips for doing the binding, which is my preferred method. I used Warm and White 100% cotton batting for this quilt, which is what I use if there is a lot of white fabric in the quilt. It is bleached batting and pure white, so that it doesn’t dull the whiteness of the fabric. It handles and quilts up just like regular Warm and Natural batting. I did a simple quilting at 3.5″ stitch length in Aurifil White thread. Of course, I had to make a little reading pillow to go with it! Quilts like these can be used as a decorative accent in a child’s room, as play mats or just to snuggle up with. I’m really pleased with this quilt and am listing it in the shop. This entry was posted in finished quilts on March 28, 2016 by Beech Tree Lane Handmade. When I saw this fabric in my local quilt store, it reminded me exactly of some English Chippendale china that my husband’s grandmother gave us. I love the look of that china and so I just couldn’t pass up the fabric. I set about designing a quilt around that fabric as soon as I could. The fabric is called “Garden of Enchantment” by Maywood Studios. Because of the large design in the fabric, I didn’t want to cut the fabric up into real small pieces. I even entertained the notion of just cutting squares about eight inches and alternating them with some kind of patchwork. In the end, I opted for doing hourglass blocks with a couple of different fabrics. 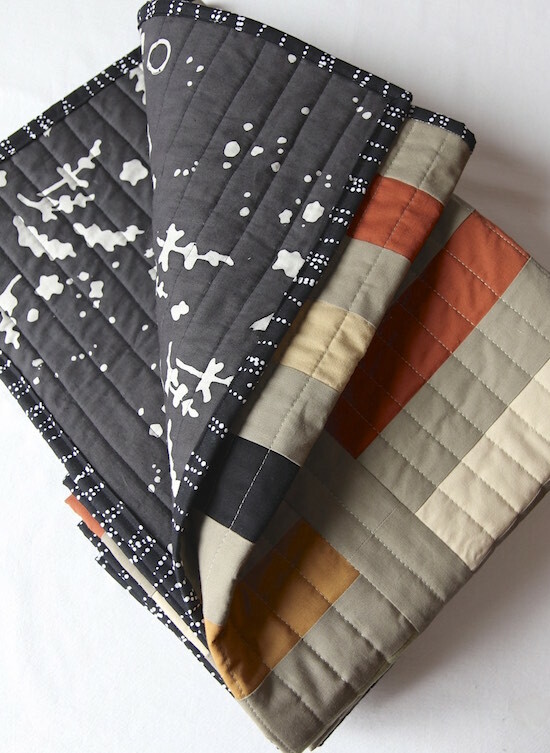 The other fabrics I used were Robert Kaufman Kona Cotton in Bone and Art Gallery’s “Stamped”, a text fabric from Amy Sinbaldi’s Paperie line, and a fabric I absolutely love and want to sneak into quilts every place I can! This text fabric is delicate but adds so much. The hourglass blocks are 8″ after being set in. There was a total of 42 blocks in the quilt. I quilted this with 40 wt. Aurifil Thread by doing a double diagonal line along the hourglass blocks with a 3.5 stitch length. This was pretty easy, because I just used the width of my walking foot as the guide. For the binding, I debated about it very little – I knew I wanted to use the Garden of Enchantment fabric itself. I thought it finished the quilt the best, instead of using something completely different as an accent, which I usually do with my bindings. For the backing, I wanted something modern as a contrast to the more traditional front, so I chose a fun fabric from M&S Textiles Australia called Sand Hill by Anna Pitjara. It’s an aboriginal inspired print and I think it’s so interesting. The batting is my usual 100% cotton Warm and Natural. The quilt finishes at 48″ x 55″, a nice lap quilt size. Thanks for stopping by – hope you’re making something! 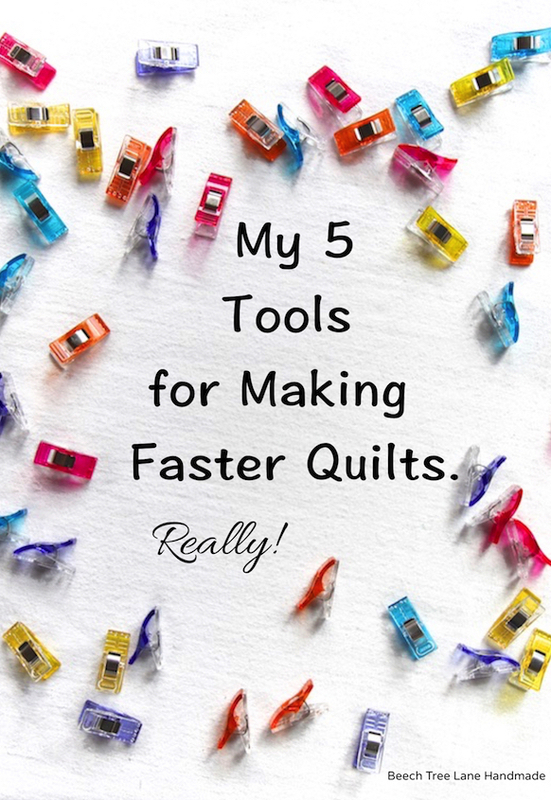 I’m linking to Sew Fresh Quilts, Free Motion by the River and Blossom Heart Quilts. This entry was posted in finished quilts on March 21, 2016 by Beech Tree Lane Handmade.